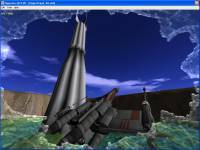 Shows how to create a more complex scene with terrain, animated textures, skybox, HUD and models. 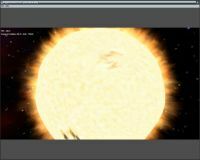 Shows the influence of vertex buffer objects (vbo) to increase the speed rendering. Shows how to use lightmaps to create soft shadows. Shows how to use use LUA scripting to simalute the water surface by moving the mesh plane vertices. 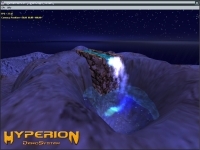 This code sample shows how to achieve a more complex scene with reflective water (reflective surface that simulates water movement), a particle system, a terrain and a skybox. This code sample shows first how to perform screenshots and how to export the current frame to an external rendering software such as POVRay or YafRay in order to get a raytraced rendering image. It uses functions of the LUA API that are linked with hotkeys. 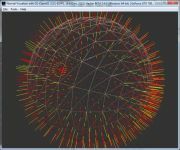 This code shows how to simulate the sun activity. 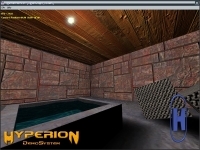 It uses several features of Hyperion and shows how to mix those different techniques to get a final result, such as primitives, mesh, blending techniques, multitexturing, sprites, billboarding, texture rotation, etc. and of course a LUA scripting code. Shows also how to split your projet in several source codes. Page generated in 0.0029489994049072 seconds.